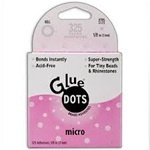 GLUE ARTS-Crop & Glue Micro Squares Adhesive Pack. These small, square adhesive come on a perforated liner for easy, mess-free application and bond instantly for permanent adhesion. The small size makes them perfect for attaching small pieces of ribbon or embellishments. 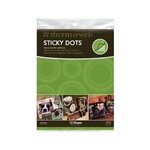 Clear adhesive dots have revolutionized crafting! No need for messy liquid glue or dangerous hot glue!